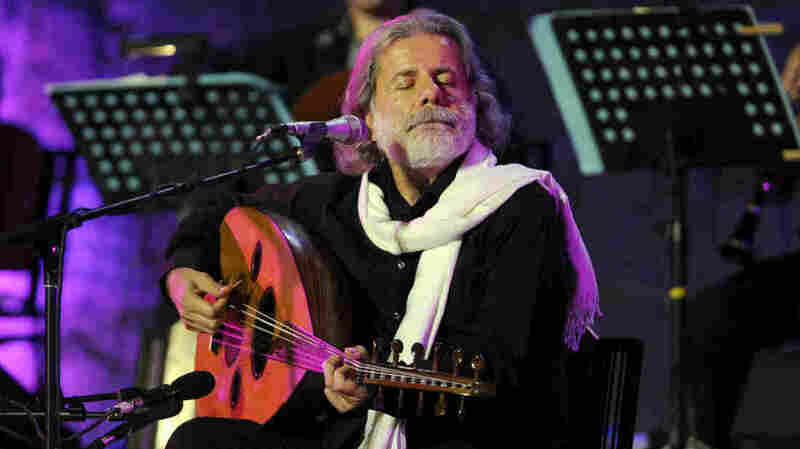 Marcel Khalife's 'Andalusia Of Love' Is An Urgent Reminder That Peace Is Possible For over four decades, Khalife has made music amid political turmoil and social upheaval. His latest album, Andalusia Of Love, is brooding and wistfully optimistic. Marcel Khalife performs in Carthage, Tunis in 2012. His new album, Andalusia Of Love, is an exploration of religious pluralism. Marcel Khalife is a Lebanese composer, singer and innovator on his instrument, the lute-like oud. Khalife performed his first concerts amid the rubble of bombed-out buildings in Beirut during Lebanon's civil war. Now, 40 years later, he is one of the most prolific figures in Arabic music. Khalife's new album, Andalusia Of Love, combines classical, jazz and folk idioms with poetry to create a provocative new work. Khalife sings with a kind of wistful optimism. He has lived and created amid some of the most terrible and intractable conflicts of our time, yet he continues to dream of peace and reconciliation. In this suite of 14 seamlessly linked pieces, Khalife returns to a touchstone of that dream: Andalusia. Andalusia is a region in the southern parts of Spain and Portugal, where Muslims, Jews and Christians lived together for centuries during medieval times. For Khalife, that history is an enduring reminder that peaceful cohabitation is possible for people of these faiths. Khalife himself is a Christian, but throughout his career, he has set to music the words of a Muslim writer, the late Palestinian poet Mahmoud Darwish. On this album, the composer and poet conjure a world they can only imagine, but that burns within them like the memory of a first love. Khalife performs this suite with his sons, Rami and Bachar, on piano and percussion, and Gilbert Yammine on the jangling, ethereal string instrument called the qanun. Their instrumental textures animate the yearning, nostalgic sentiments in Darwish's poetry. This brooding, beautiful, urgent music may call you to spend an hour in a world where peace is not a dream, but a hard-earned reality.